So your first Greenbelt’s coming up. And you’re sat in front of the telly wondering what on earth to pack, and how you’re going to be able to see everything you want to see on the head-spinningly busy programme in front of you. It’s okay. Breathe. We’re here to help. If you’re a city dweller surrounded by near-constant light pollution, then you probably don’t know this: the countryside is dark. (Like, very dark.) And you don’t want to bring your Greenbelt debut to a swift end by tripping over someone’s tent on the first night while attempting to find your own. So, pack a torch. Better still, a head torch! It’ll make you feel like a true adventurer. It’s a festival, so by the end we’re all going to be a little bit…interesting-smelling. And covered in mud splatters (possibly, probably). So don’t worry about bringing your entire summer wardrobe with you. And five camping chairs. And a Space Hopper. And every Harry Potter book. Instead, travel light. You’ll thank us when you’re carrying all your stuff from the car. And an umbrella. I mean, it’s not going to rain. Definitely not. No way! But it might do…and you can never be too careful. This one takes up hardly any room in your bag. 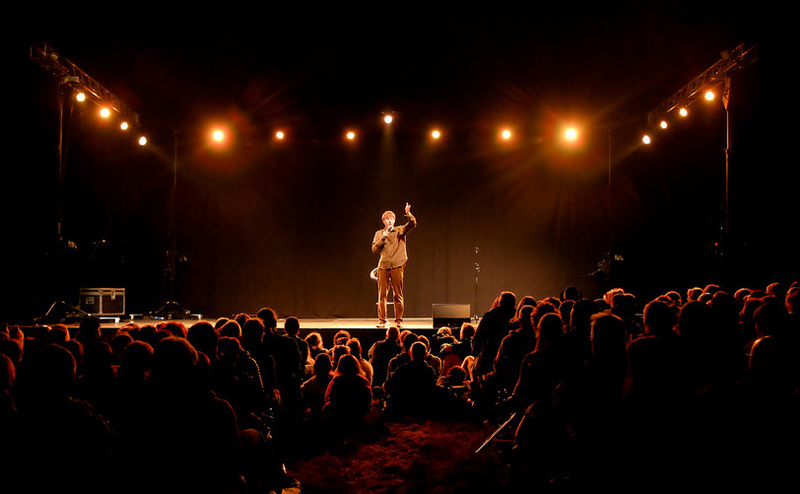 There’s a lot of stuff on at Greenbelt…which is putting it lightly. To attend everything the festival offers, you’d probably need to clone yourself at least ten times. (Which is a slightly terrifying thought. And would make the site rather full if we all did it.) So it’s a good idea to check out the programme ahead of time (by downloading our iOS or Android apps) and marking the things you fancy seeing. It’s easier than doing it by torchlight in your tent on Friday night. No matter how rigorously you’ve planned, plans change. You’ll get stuck in the paella queue. Or a debate about Brexit. Or watching a juggler (who can resist a juggler?) So don’t get too worried about it. Be in the moment. Embrace the unexpected. Talk to a stranger. Sit on your back and stare at the sky. Relax. Be.